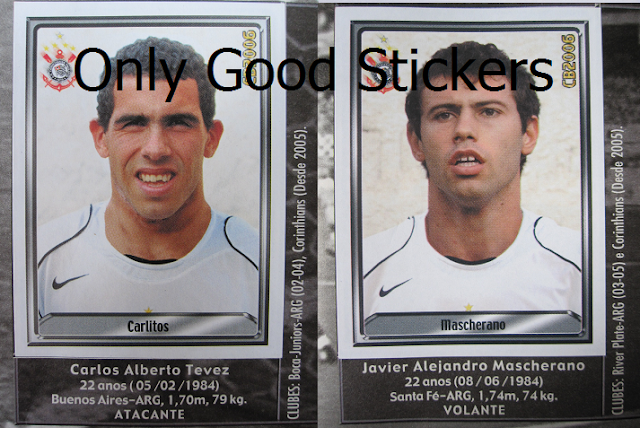 The album Panini Brasileiro 2006 includes all the Brazilian teams of Serie A and Serie B for a total of 500 stickers. Serie A teams are displayed over two pages with 17 stickers: a shining club badge, a silver mascot sticker, 12 individual player stickers, and 3 stickers with double players. The total is thus 18 players for each Serie A team. We can find in this album some familiar players: Tevez and Mascherano in Corinthians before they moved to Europe, Jonathan (now at Internazionale) and Eder (ex Bayern Munchen goleador) in Cruzeiro, and the young Thiago Silva (Fluminense, now at PSG) and Lucas Leiva (Gremio, now at Liverpool). Serie B teams are introduced by a table of contents. Each team is shown on one page with a total of 8 stickers: a shining club badge, a silver foil mascot sticker and the team photo composed by six stickers. This big sticker puzzle of the team is a special feature of this album. Although the final puzzle is a big size photo showing clear faces of all the players, it is not always easy to compose a good picture with six stickers, because the stickers have different sizes and the borders do not always match with each others. 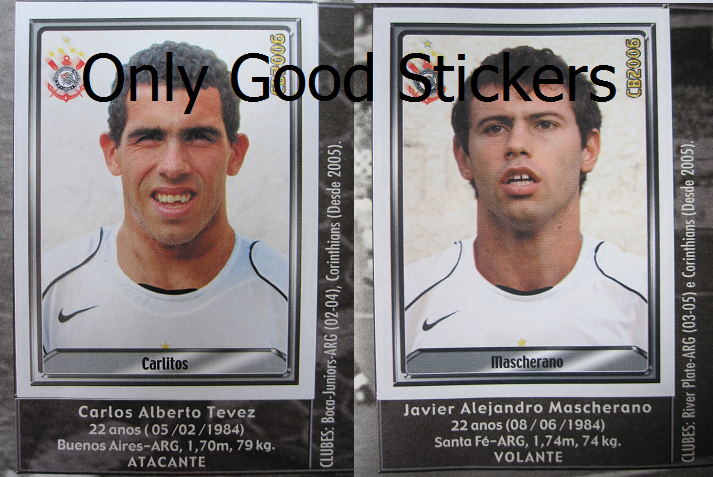 The Argentinian Carlitos Tevez (21 years old) and Mascherano (21 years) both playing for Corinthians before they moved to Europe and had great success. 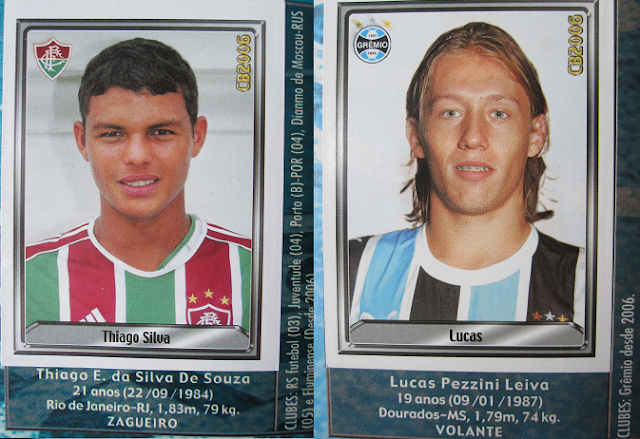 Thiago Silva (21 years old, Fluminense) and Lucas Leiva (19 years old, Gremio) at the beginning of their career in Brazil. They are now players of PSG and Liverpool, respectively.